Kevin Hoskins (left) was one of several students who worked on a summer research project in which a mobile device with a 3D scanner was used to map human bodies for dimensional measurements. 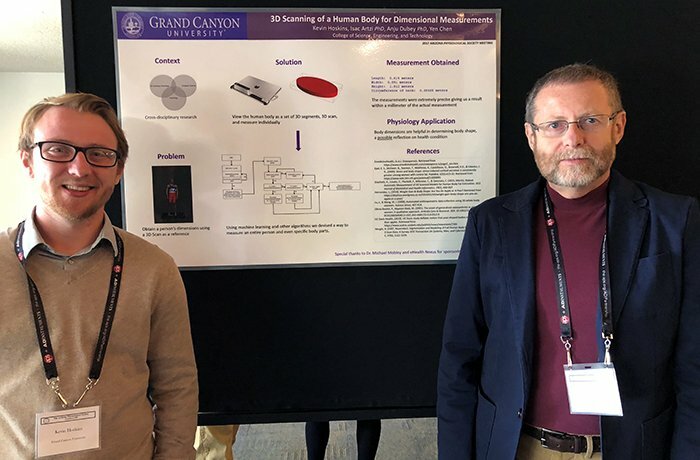 The results were presented by Hoskins and Dr. Isac Artzi (right), GCU Program Lead for Computer Science, at a recent conference of the Arizona Physiological Society. Imagine being able to tell how much a child has fallen behind on the growth chart, or if a soon-to-be mom hasn’t gained enough weight or has gained too much, just by doing a quick body scan on an iPad and glancing at a patient’s full body avatar on a computer screen. Goodbye, measuring tape and written log. That’s the idea behind a GCU summer internship project whose results were presented recently at the Arizona Physiological Society conference on the campus of Northern Arizona University. “Dr. Mike Mobley said, ‘Hey, I’ve got this 3D scanner you hook up to an iPad,” GCU computer science student Kevin Hoskins said in his conference presentation. “It’s basically an iPad with a specialized sensor attached to it,” said Mobley, Executive Director of GCU’s Center for Integrated Science, Engineering and Technology and also the co-founder of eHealth Nexus. The idea behind the project was to take this technology – a mobile device (an iPhone or iPad) with a 3D scanner attachment – then capture body images so that researchers could wirelessly monitor and dashboard a body’s dimensional measurements. Ultimately, the goal is to detect changes in someone’s body as a way to keep track of their health. What researchers did was take the iPad, with its 3D scanner attachment, and walk around a subject to be measured, scanning the middle part of the body, then lifting the 3D scanner from the top of the head to the bottom of the feet. “We take the data from there, and, as computer scientists, Dr. (Isac) Artzi and I, we analyze it. We apply our algorithms and magic and whatnot to it to make sense of it, and then the physiology is where it’s applied,” Hoskins said. Researchers exported the data as an object file, which the team split up into vertices in three-dimensional space. The team would look to the body part they wanted to measure, then would take all of the vertices and data associated with that body part to create a segment. Researchers essentially viewed the human body as a set of 3D segments, which they measured individually. Once they do that, they can calculate the dimensions. The team members focused mainly on the neck area for their testing. They found where the vertices were, created a cross segment of the neck and used an equation for the perimeter of an ellipse to get the dimensions and the circumference of the neck. They were able to compute the dimensions of a mannequin’s neck, down to the millimeter. Artzi, Computer Science Program Lead in GCU’s College of Science, Engineering and Technology, said the team was able to detect the segments of a human body using a subset of artificial intelligence called machine learning. He said the idea is to measure, say, the length of a certain part of the shoulder of 100 people, then get an average for that measurement, which would then be used as a reference. What a user would be looking for is irregular shapes. Artzi said physiologists have told him that certain body elements get slightly deformed if a subject suffers from certain conditions. He added that body shape – the human body is usually pear- or apple-shaped – can be an indication of health conditions. So dimensional measurements are important in monitoring health and fitness. Weight isn’t enough, the team contends, to set health and fitness goals. Body dimensions, mass body density and skin area also are important health indicators. Such metrics could be measured via 3D scanning. Besides those uses, he said a mobile 3D scanning device could help health care professionals keep track of patients with peripheral edema – the accumulation of fluid, usually in the lower limbs – or to better monitor patients with weight problems, chronic diseases (such as diabetes) or to keep track of childhood development. What’s so exciting about the project for those involved is that it spanned more than just one discipline. “The application was intended to be in health and fitness, and it was using optics and engineering of a device, then coupling that with algorithms,” Mobley said. So the effort involved the collaboration of computer science, engineering and physiology faculty and students. He cautioned that this project is simply that – a project in concept form that could be developed further, depending on interest. “We have an idea and showed proof of concept. … Maybe it’s of use to someone,” said Artzi, who worked with the students – that’s Kevin Hoskins, Erik Weimer and Aaron Scirocco – along with Dr. Anju Dubey, who teaches genetics and human anatomy and physiology at GCU, and pre-med student Yen Chen. One downside is that the scanning took longer than project researchers wanted it to.